GRAPEVINE, Texas — Within the next few years, the truck tire you buy may be manufactured in part with soybean oil instead of petroleum. At its annual Customer Care Conference, Goodyear Tire and Rubber Co. showed off some of the research that is taking place with alternative methods of tire manufacturing, and soybean oil appears to be among the most promising ideas. During the manufacturing process, petroleum is used to form synthetic rubber and polymers. In passenger and light-truck tires, synthetic polymers make up 24% of the product and in truck tires it is 11%. The Akron, Ohio-based company has researched and tested soybean oil use for several years. Since 2017, Goodyear has been manufacturing the Assurance WeatherReady passenger tire, which the company said keeps rubber compounds pliable in changing temperatures, especially in very cold temperatures. Kerns also said tires made with soybean oil improve manufacturing efficiency and reduce energy consumption. Company officials showed reporters sections of two types of tires, one constructed with petroleum and the other with soybean oil. The sections were kept in a freezer for several hours and when they were removed, the results showed the tire section constructed from soybean oil was significantly more pliable than the one made out of petroleum, which was brittle and could almost be cracked with enough force. “In the truest sense, we are talking about a concept called glass transition temperatures, which is the point at which the material stops becoming more elastic and becomes more glassy,” Kerns said. Whether petroleum or soybean oil, the oils are part of the synthetic polymers that determine the performance of each component in the tire as well as its overall functionality, including rolling resistance, wear and traction. Goodyear said that just by using soybean oil in its consumer tires it has saved the equivalent of 414,000 gallons of petroleum, or what could be hauled in 12 railcars. Figures showing how much petroleum is used to construct a truck tire are not available. However, according to the U.S. Tire Manufacturers Association, it takes about seven gallons of oil to create a standard passenger or light-truck tire. Goodyear officials could not put a specific date on when a commercial truck tire that is manufactured with soybean oil would be available, but they predict it could be within five years. In 2018, American farmers produced nearly 11 million tons of soybean oil, about 20% of the world’s output of the commodity. During the research phase of its car and light-truck tire using soybean oil, the tire maker worked with the United Soybean Board to develop the product, with USB providing some funding. Soybean oil is widely used in food products including cooking oil, salad dressings, margarine and mayonnaise. It also is used in printing ink and oil-based paints. "Goodyear and the soy checkoff share something special: a commitment to innovation," said John Motter, United Soy Bean board director and a farmer from Jenera, Ohio. "Businesses looking to use soy, even if for sustainable purposes, want to see not only a price-competitive product, but one that functions the same or better than their original product. 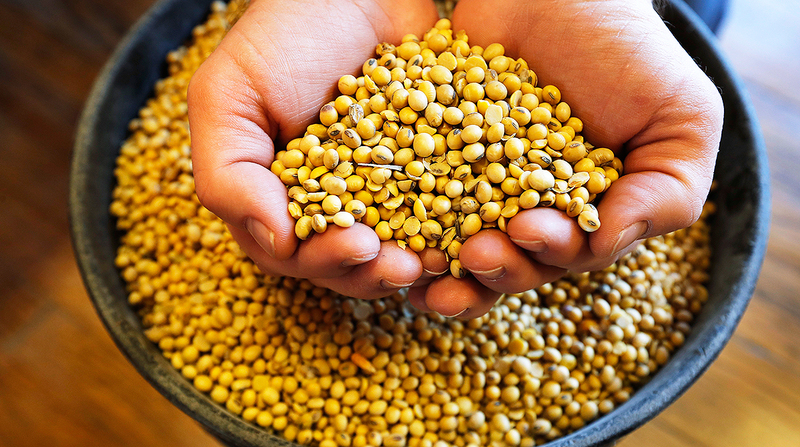 "That's why the checkoff works with companies such as Goodyear to test soybean oil and confirm its characteristics, so we can increase demand for our product and ultimately increase our profit opportunities."